The vibrant blue hues in Mike Bodge's creative website represent the early hours of dawn in New York City. 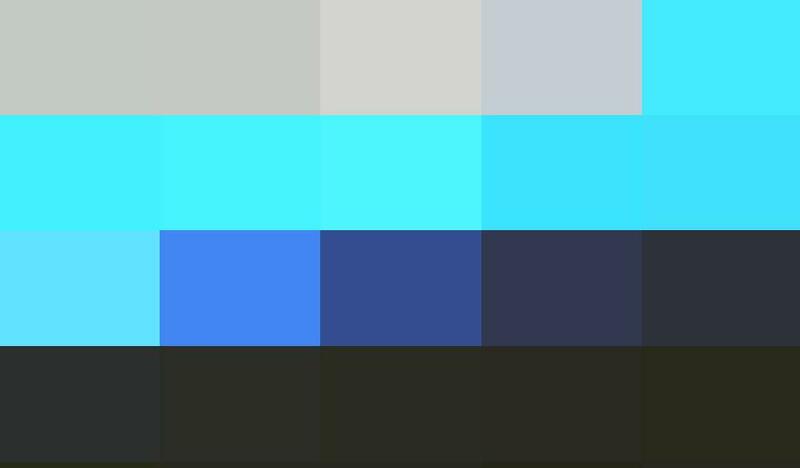 NSKYC is a website by Mike Bodge, creative director of Lolz LLC, a New York City-based digital agency, that shows the average color of New York City’s sky, taken in five minute intervals. Launched earlier this week, the website is the product of a program Bodge wrote to record the changing colors of the city skyscape. Inspired by the artist’s office view and strengthened with his design background, Bodge’s program instructs a webcam to take a photograph and upload the image to a server, which reads the sky portion of the image pixel by pixel. Upon surveying all of the pixels in a given image, Bodge’s program averages the values and assigns an RGB value that best represents the average color in the sky. The artist is even considering placing a webcam in every major city across the world, plotting the colors of the sky on a map. Using this method, Bodge’s work of art could have a real-world application. Perhaps, images taken over a longer period of time in areas struggling to implement sustainable transportation policies can serve as qualitative data. Though NSKYC has garnered the most attention out of all of Bodge’s projects, it is by no means his first attempt to document his environment. Previously the artist built websites like Subway Crush and Williamsburg Eats to connect urban residents with local information. Bodge is currently working on a secretive transportation project that deals with taxicabs. Better keep an eye on this one! Want to see more? Visit www.nskyc.com or follow Mike Bodge on twitter.